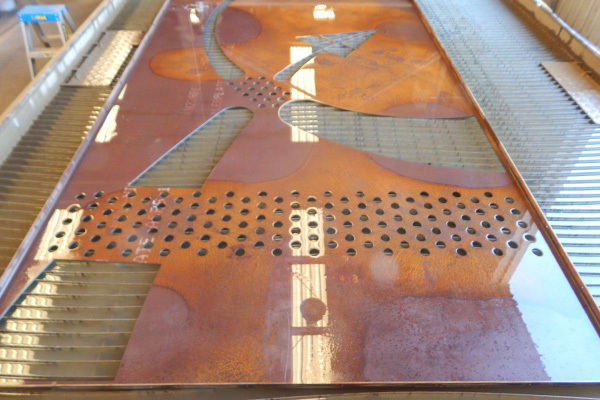 Water jet cutting in Toowoomba reached new heights when we introduced our 6000MM X 3000MM Omax machine as an alternative source non thermal processing of hardened steel & various materials that is beyond the capability of both plasma & laser cutters. We have the capacity to cut up to 150mm thick steel. Our Omax has an incredible software package that enables us to cut almost any material at any angle. We successfully cut expensive floor tiles from Italy, nylon material for trailer wear plates, stainless steel for signs, alloy sheet for trailers as well as steel plates for skid plates & turntable base plates for trucks including the hole mounting patterns required. We no longer have issues with holes in Bisalloy plate & can even cut a square hole with a countersunk taper. At no time does the material get a heat affected zone as it would in conventional methods using laser, plasma or other thermal practices. Our Omax Water Jet has lathe chuck mounted on the end of the machine bed that is interfaced with the 5 axis cutting head. This allows us to cut any shape we require on a round surface. We use Solidworks as our drawing program so can accommodate any cad drawing or .dfx file that you wish to use. Even something as basic as a sketch or photo can be worked with. 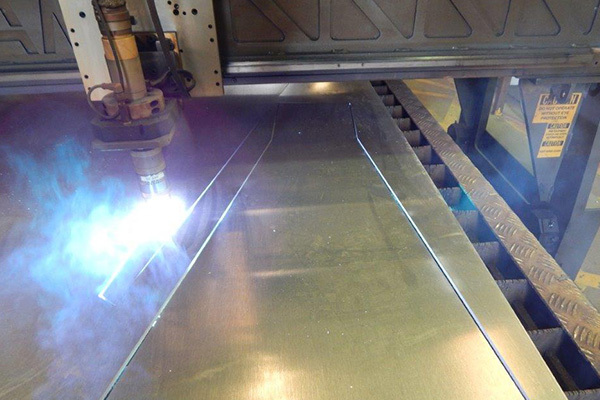 At Chassis Line Toowoomba we increased our versatility when we introduced the Matcam High Definition True Hole plasma cutter into our business. 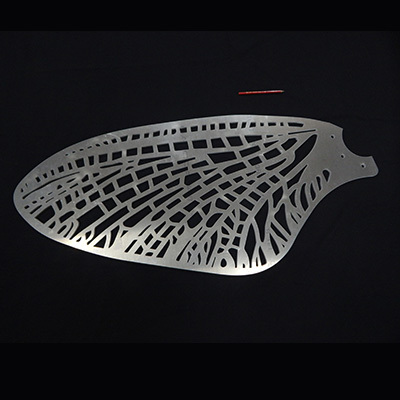 It provides a faster cut as opposed to our water jet cutter, however we now have the ability to offer our customers the correct cut product for the most cost effective price by having both options available. What does your building say about you? Chassis Line can help you create a commercial façade that will make your building unforgettable and worth looking at. With our Omax Water Jet cutting machine, we can produce custom design commercial facades and decorative features to renovate existing buildings or add to new building projects. The choice of material is yours with the machine’s capacity to cut steel, alloy, stainless steel, marble, stone,tiles, timber, plastics and the list goes on. 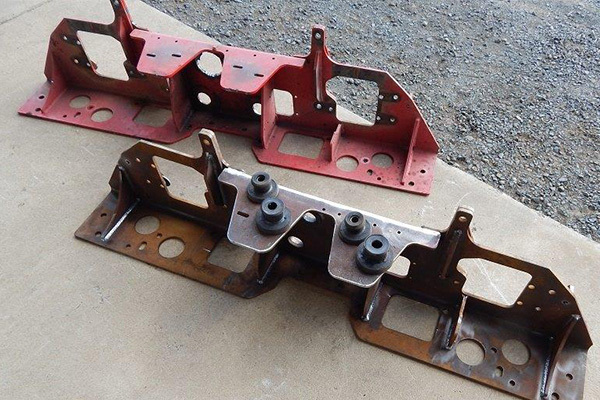 Chassis Line Toowoomba has been continually re-investing in its workshop equipment & procedures. It all starts in our engineering department with a design concept, then within our Solid Works drawing program we produce a full working model which we can BOM down to individual pieces. Some concepts are yours alone & we invite you to sit with our draftsmen to draw, design & process your unique requirements. If you have the staff but not the resources we are happy to draw, cut & process your project for you complete in your own factory.